Every national park we visit has a story to tell. That story combines the history, the geography, and the people who share in a park. To find that story, most times we have to “get personal” with a park. We never felt the “drive-thru” version helped us really know a park or what to recommend others do there. Of the parks we visited on our July 2017 trip, Kenai Fjords National Park in Southern Alaska told us the best story. Kenai is full of what Alaskan’s love about the state. A rich and abundant ocean. Close encounters with wildlife. A long and storied Native history. Oh, and don’t forget the glaciers, whales, and outstanding hiking and kayaking. And unlike many of Alaska’s parks, Kenai Fjords National Park is accessible by car, just a short 2.5-hour drive south of Anchorage. To hear the story of Kenai, we experienced the park by boat, by car, and by foot. Today we’re sharing our list of the best ways you too can “get personal” with the park, hear the story it has to tell and come away with some of your own national park memories to share. 1. Take the ranger-led boat ride. Departing from the Seward Harbor, the National Park Service offers daily wildlife and glacier viewing and dinner tours of the park during the summer. Look specifically for the tour with a park ranger. It may cost you a bit more and be a bit longer boat ride, but it’s essential for hearing the best stories about the park. By having a ranger guiding your boat tour, you stand a higher chance of getting the most information and getting your questions asked about the park. Plus, a ranger on-board means your tour company complies with all park regulations related to disturbing the shoreline and the wildlife. 2. Take a kayaking tour. If steering your own boat is more your style, kayaking might be a good choice for your trip to Kenai Fjords. Multiple outfitters offer kayaking trips around the park during the summer. Half day trips start around $75 with options for full and multi-day trips around the park. When we researched kayaking tours, there was even an option for a heli-kayaking tour (pick up and drop off with your kayak by helicopter) to one of the more remote glaciers in the park. 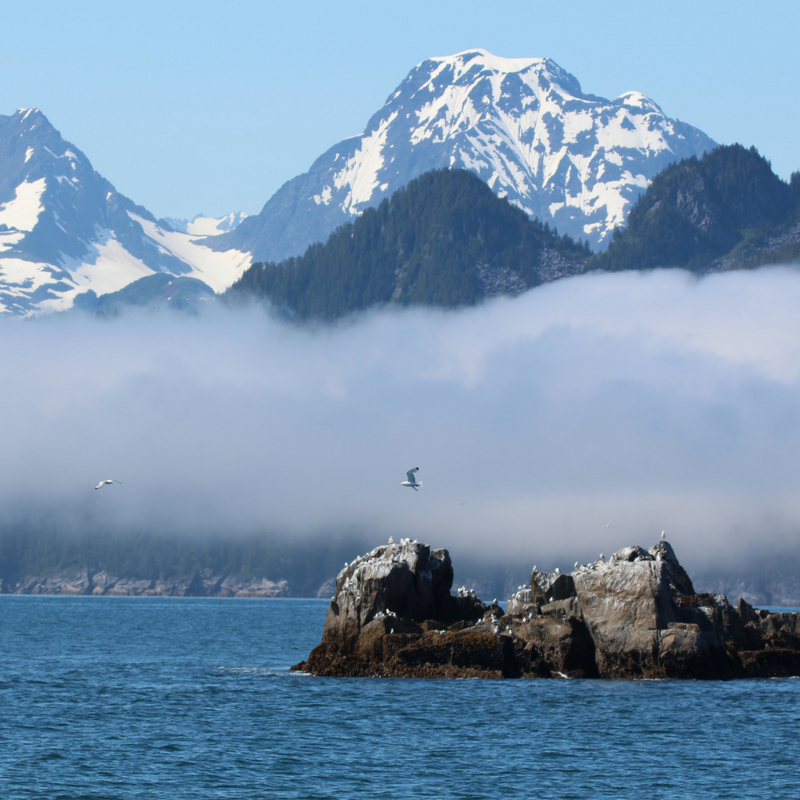 Much of Kenai Fjords National Park is accessible only by boat. Fox Island, located directly across Resurrection Bay from the park headquarters, is another spot worth crossing the seas for. Fox Island became well-known in the 1920’s when wildlife artist Rockwell Kent painted scenes from the island and areas of Kenai Fjords. He also published one of the most famous wilderness books written about Alaska: Wilderness: A Journal of Quiet Adventure in Alaska . You can find the same solitude Kent did with a stay in one of the cabins or hopping off the boat for dinner in the lodge. There’s also a ranger outpost here with passport stamps. Wildlife boat tours bring you close to some of the park’s many residents including bears, whales, sea lions, sea otters, and harbor seals. 4. See Kenai Fjords from above. As with many of Alaska’s National Parks, taking in the park from a small plane can be one of the most intimate ways to learn Kenai Fjords story. Overflights give the best perspective on the size of the park, the dramatic look of the glaciers from above, and the scope of the protected land. 5. Hike the Exit Glacier and Harding Ice Field Trails. It’s hard for us to get a good sense of a national park without spending at least a few hours hiking the trails. Kenai Fjords National Park certainly does not disappoint. Hiking the Exit Glacier area provides some of the closest glacier viewing on organized trails in all of Alaska. Visitors can see the dramatic recession of the glacier in the last 25 years and understand how climate change is impacting the park. The Harding Ice Field is one of the largest of its kind in the world. The 8.2-mile out-and-back hike is strenuous but offers amazing views of the park and the glacier. Ranger-led and overnight options are also available.